The Lo Shu magic square is a very famous Chinese luck charm which is extensively recommended in Feng Shui. The geometrical value of this square is 15. 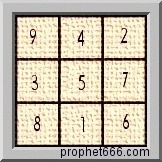 This magic square is like any other Indian Yantra and is almost similar to the most powerful Yantra about which I had written about some time back. Like the Lo Shu that Yantra also vibrates to the same numerological frequency. Success in career related matters. Auspicious for marriage and relationships; including family, friends, society and children. Success in pursuit of power and publicity. Good health and peaceful atmosphere in the home. Correction - In the first row 9 and 4 should swap positions. How do I prepare this lucky charm? Any specifications? Should it be placed inside the door/house or outside? I believe the numbers are not in order in the picture. 9 and 4 should swap positions, otherwise, vertically the first and second columns are not adding up to 15. First row 4,9,2; second row 3,5,7; third row 8,1,6 seem to be the correct configuration. Correct me if I am wrong please. Else, this will not work for anyone. Thank you! Thanks you for pointing out. Note has been given above. My pleasure and thank you for such a prompt action! It means first 4 and than 9 should come? And can u please elaborate how to prepare this i mean any specific like copper or paper? Please tell me how to prepare this Magic Sqaure? On a paper with any ink or on Bhojpatra with some specified ink and do we have to make amulet to tie or we can keep in wallet or pocket. This charm is a Chinese wall hanging made from cloth or even a painting. It can be painted on paper and framed. Either inside or outside; if inside then the charm must be facing the main entrance. Sir, can you design a yantra which can make a man youthful, healthy, fair (skin), charming and attractive? above you said The geometrical value of this square is 15,what does it mean,will explain it,thank you sir. all my search for prosperity and luck ended here . Thank you sir. Its exactly like Sun yantra . Seems like chinese just renamed it.